Ubar Grotto is getting an artist;s treatment. Well, at least one of our fezzes is anyway. Miss Georgette Williams, girlfriend of Pro. 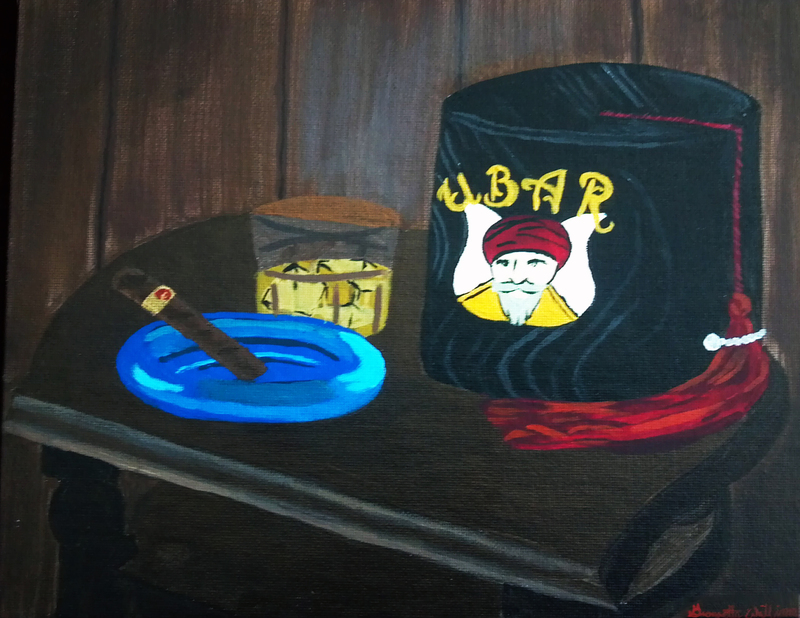 Seth Anthony, PM, recently created an original still life painting of an Ubar fez in a manly setting. The original of this painting was given to Pro. Shaun Sponagle and hangs at his cigar shop, D & S Cigars, in Lancaster, PA. But, the officers of Ubar realized that others might also want a copy of this piece, so we will be offering prints for sale. The prints are full color, 8.5 x 11, on high quality paper. Each print will cost $5, with a portion of the proceeds going to benefit the Humanitarian Foundation. Prints will be on sale at our next meeting. If you cannot make the April meeting, but would like to purchase a print, drop an email to ubarsecretary@gmail.com.